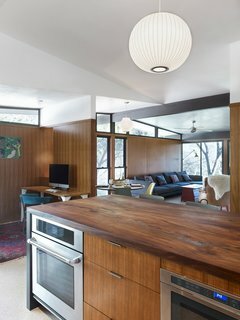 Warm, glossy, and earthy, wood countertops are decidedly beautiful, but they do require some upkeep. 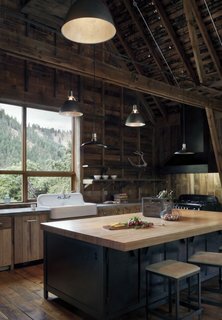 Wood is a sustainable kitchen countertop option that combines natural beauty with a lower budget. However, whether you have solid wood or butcher-block countertops, keeping them as good as new takes some elbow grease and a few preventative measures. To prevent stains and scratches, we offer some pro tips to keep your wood countertops looking their best. A Rohl faucet was stripped and replated in brushed brass. 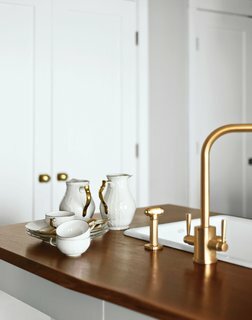 The modern fixtures prove a lovely contrast to the American walnut countertops and original Rosenthal dishware. After new wooden countertops—both butcherblock and solid wood—have been installed, a campaign of mineral or tung oil should be rubbed into the surface. This is essentially the first line of defense against wear and tear, and can be done very easily by pouring liberal amounts of oil onto the wood surface, allowing the oil to soak into the wood. After about half an hour, excess oil can be rubbed off with a soft cloth, leaving behind a more durable, stain-resistant surface. Oiling should be repeated once every year or two. 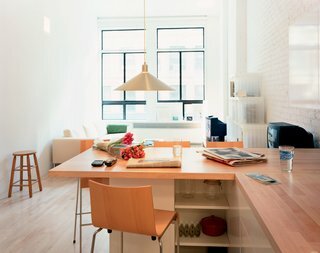 In this tiny, 240-square-foot shoebox of an apartment in NYC with a sleeping loft over the kitchen, architect Tim Seggerman went straight to his toolbox to craft a Nakashima-inspired interior. Although you want the initial oil application to sink into the wood, this isn’t what you want to happen with other liquids. If you spill some wine, vinegar, or other colored or acidic liquids on the counter, wipe them up quickly before they seep into the wood’s porous cell structure, staining your countertops. 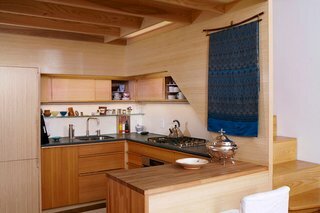 The differing grains of the teak veneers and elm countertop add complexity and rhythm to the kitchen's wood motif. A Stuc Pierre plaster ceiling selected by the homeowner, Sloan Houser, adds an airy feel to the opened space. If you aren’t able to wipe up spills before they turn into stains, try natural stain removers and sanding. A light sanding with high-grade sandpaper works wonders on light stains and scratches, which can be sanded out and then oiled. If a stain is too deep for sanding, try cutting a lemon in half and rubbing the wood with the lemon, along with a dash of salt, for extra scrubbing power. 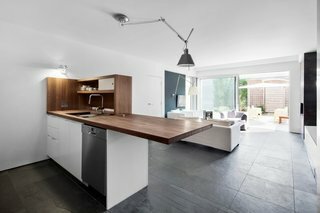 The combination dining table/countertop, says Woo, "is both a demarcation and connection between the kitchen and main living space." Originally, the architect considered a concrete surface, but balked at the delivery time and expense. "I kind of like it as it is built," he says. 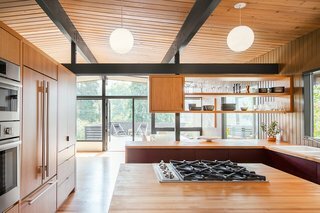 "All the horizontal surfaces are wood." The Conical pendant lamp is by Jorgen Gammelgaard and the Compasso d’Oro bar stools are by Enrico Franzolini. Wood, unlike many natural stone counters, doesn’t do well when it comes into direct contact with very hot items like searing hot pans and pots. Keep trivets and potholders handy to protect your countertops from stains and damage–if you start doing this from the beginning, soon you won’t even have to think before reaching for a potholder. By foregoing a fixed dining table in favor of a large American walnut wood countertop by Cuisine Elysee, the couple is able to enjoy a open space with a clear view of the back of the house and the garden terrace outside. Similarly, keep cutting boards within easy reach to prevent yourself from being tempted to cut directly on your countertops. We know, they look just like your countertops, and might even be made out of the same kind of wood, but you’ll regret it once you start seeing scratches and knife marks all over your otherwise spotless wood counters! With the constant oiling and maintenance of a wood countertop, we understand that it might be appealing to coat your wood counters in a shiny, smooth polyurethane finish. However, doing this will actually end up being more work in the long run because it will be difficult to evenly sand out any stains or scratches that eventually appear. Rather than sanding the entire counter and re-coating, oiling has the benefit of allowing for spot fixes, while a coating requires entire refinishing. It’s also easier for moisture to get caught under the scratches, making them expand and swell.